Gov. Paul LePage used the lure of higher wage increases for members of Maine’s largest state workers union to win a key concession in his campaign to weaken the clout of organized labor. In exchange for a 6 percent pay increase over the next two years, negotiators for the Maine State Employees Association have agreed to eliminate the requirement that state employees who choose not to join the union pay a mandatory fee to the union for collective bargaining and other services. If ratified by a union membership vote, the deal would represent a victory for LePage, an opponent of public-sector unions who once said his inability to eliminate the requirement that employees pay agency fees to labor unions was among his greatest failures as governor. MSEA leaders countered that its members are underpaid and that negotiators were forced to accept the more lucrative offer. Union and state negotiators agreed to the two-year labor contract last week after what Rod Hiltz, MSEA-SEIU Local 1989 executive director, called “six months of hard bargaining.” Union members subject to the contract — more than 9,500 employees in the executive branch of state government — have until Aug. 30 to ratify or reject the deal. Hiltz said state negotiators offered 1-percent raises over two years if the union opted to keep agency fees but 6-percent raises if the union rejected them. Negotiators from another union, the American Federation of State, County and Municipal Employees, which represents approximately 800 corrections officers and mental health workers in Maine, rejected a similar offer of a higher raise last week in exchange for abolishing agency fees. AFSCME’s members are also in the process of ratifying or rejecting the agreement. The agreement includes a 1 percent raise for the two-year contract as opposed to two 3 percent raises and the cancelling of the agency fee requirement. Mandatory agency fees are paid by all state employees who work in departments or agencies represented by AFSCME and MSEA. The fees are separate from union dues, which some employees — more than 7,000, in the case of the MSEA — pay voluntarily. In exchange for the agency fees, unions are required by Maine law to provide a number of services on behalf of all employees, such as representing them in grievances, disciplinary incidents and contract negotiations. Members of both the MSEA and AFSCME have worked without a contract for several weeks. Jim Durkin, a regional director of legislation, communication and political action for AFSCME, said employees subject to the contract will take a financial hit in the short term but benefit in the long run from union representation, whether or not they are members. Requirements that all state employees contribute financially to labor unions were put in place in 2003 under Democratic Gov. John Baldacci in what was known at the time as “fair share” legislation. Attempts to eliminate fee requirements for labor unions in Maine are nothing new. In 1948, voters at referendum rejected anti-union measures on the ballot 2-to-1, according to a column in the Bangor Daily News earlier this year by Charles Scontras, a historian at the Bureau of Labor Education at the University of Maine. “Right to work” legislation — or “right to work for less,” as organized labor proponents put it — has been attempted in Maine numerous times, including throughout LePage’s time as governor. 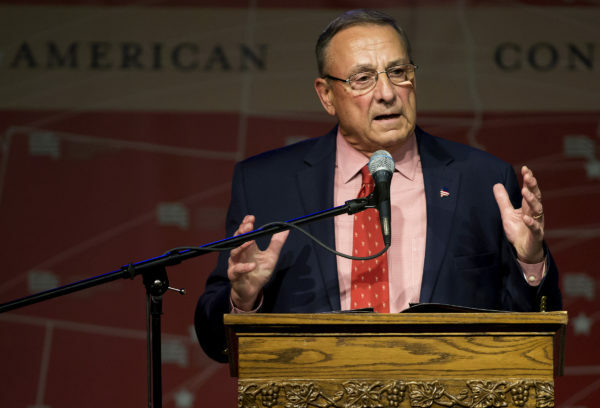 LePage and many of his Republican colleagues have long argued that eliminating unions would be good for Maine’s economy because it would attract companies to Maine that are otherwise settling in non-union states. LePage sponsored right-to-work legislation that failed in 2011 despite Republicans holding majorities in both chambers of the Legislature. In 2012, he told reporters that his ability to enact the measure was his biggest failure as governor. Several other bills have failed since then — mostly because of solid Democratic opposition but with some Republicans on board — including LePage’s 2014 proposal to create “Open for Business Zones” where among other provisions, employees would not be required to pay any fees to unions. Earlier this year, the Legislature killed at least three anti-union bills, including a proposal to require union members to vote every other year whether they want to dissolve their union. It died in the Republican-controlled Senate. Hiltz said contract negotiations are a better venue for making changes like these than the Legislature because ratification allows union members to decide for themselves, though he credited lawmakers from both major political parties for recognizing that. “This union was strong before when we have had agency fees and will be strong after we don’t have it anymore,” he said. Agency fees from the MSEA’s executive branch employees would be eliminated as of January 2018, according to the pending contract. Hiltz said approximately 2,300 of those workers pay agency fees, compared with more than 7,000 who are full union members. Right to work provisions are in place in 28 states. Later this year, the U.S. Supreme Court is scheduled to decide whether to take up a case brought by the National Right to Work Foundation, which seeks to impose “right to work” on all public unions.